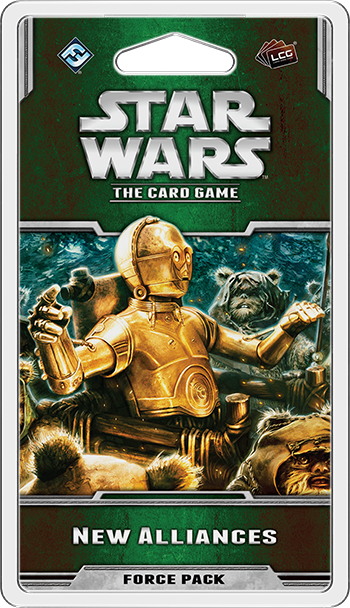 Fantasy Flight Games is proud to announce New Alliances, the second Force Pack in the Endor cycle for Star Wars™: The Card Game! General Solo, Luke Skywalker, Chewbacca, and Leia Organa descend to the Sanctuary Moon of Endor in order to sabotage the shield generator that protects the second Death Star. They quickly discover, however, that Endor is not devoid of sentient lifeforms. The native Ewoks are formidable warriors in their forest home, and their help could prove crucial to destroying the Imperial presence on the moon. 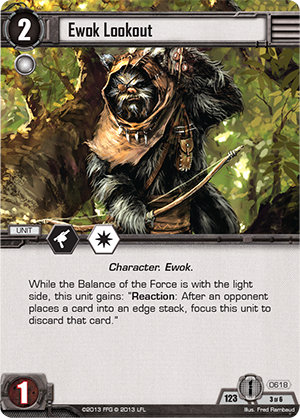 In New Alliances, you can join the Ewoks of Endor to defend their home with a new neutral objective set for the light side! The set begins with the Courage of the Tribe (New Alliances, 938) objective. This objective invites you to harness the tribe’s fighting spirit by allowing you to remove an additional focus token from any Ewok unit after you refresh. With Courage of the Tribe among your objectives, you can resist your opponent’s tactics icons and easily refresh your Ewoks that are committed to the Force. Of course, the Courage of the Tribe wouldn’t be much use without some Ewoks to refresh. Fortunately, this objective set boasts no fewer than three Ewok units, starting with Chief Chirpa (New Alliances, 939). Chief Chirpa is a wise leader of the Ewoks on Endor, and you can use him in almost any capacity. Chief Chirpa’s combat icons are equally useful on attack or defense, and he can even provide a resource if necessary. Chief Chirpa’s most powerful abilities, however, reflect his fair and effective leadership of his village. 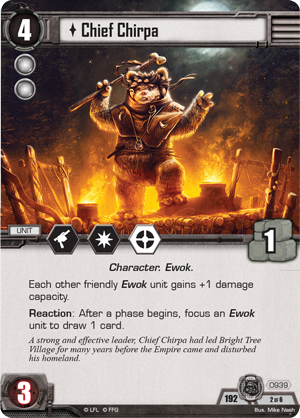 While you have Chief Chirpa in play, each of your other friendly Ewok units gains a heightened damage capacity, keeping units like the Ewok Lookout (Darkness and Light, 618) alive to plague the dark side with their cunning raids and forest ambushes. Added resilience isn’t all that Chief Chirpa brings to his tribe, though. After any phase begins, Chief Chirpa invites you to focus an Ewok unit to draw a card – and best of all, this ability has no limit! Whether you’ll need more cards for a crucial edge battle or simply need to search for a card to counter your opponent’s strategy, Chief Chirpa and his Ewoks give you an easy way to do it. Chief Chirpa is the leader of his tribe, but he won’t need to fight the Empire alone. You can support Chief Chirpa in battle with two copies of the Ewok Horde (New Alliances, 940) included in this objective set. These formidable units boast a deadly array of combat icons and a solid damage capacity, but you must pay seven resources to deploy an Ewok Horde among your units. 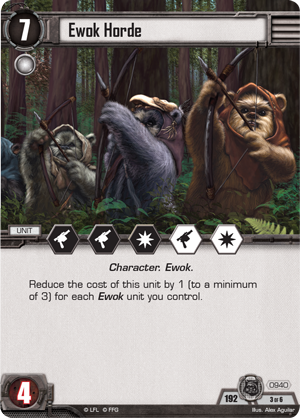 In actuality, though, you’ll rarely pay the full seven resources for your Ewok Horde: you can reduce this unit’s cost by one for each Ewok unit you control, down to a minimum of three resources. Once some of your Ewoks have gathered together, you’ll be able to quickly bring your Ewok Hordes into play. With armies of Ewoks fighting the Empire on their home ground, even the staunchest dark side warriors may become much more cautious. Ewok Hordes are powerful combatants, but even they can be neutralized by a single tactics icon if you lose the edge. Therefore, it’s important that the last two cards in this objective set help you to win edge battles. Bright Tree Village (New Alliances, 941) is an enhancement that provides a resource and grants an extra Force icon to each Ewok unit that you control or in your edge stack! Whether your Ewoks are contesting the Force struggle or working behind the scenes in an edge battle, Bright Tree Village helps you face the servants of the dark side head-on. 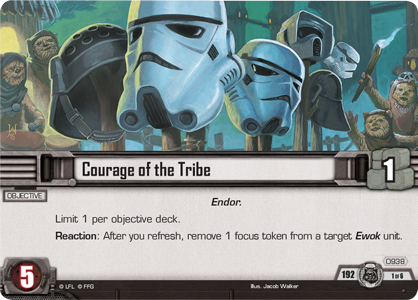 The Courage of the Tribe set concludes with one of the three new fate cards introduced in the Endor cycle: Battle of Endor (New Alliances, 942). 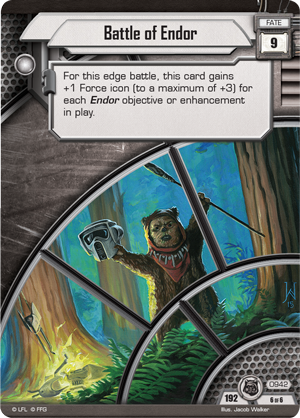 This fate card has one inherent Force icon, and it gains one additional Force icon for each Endor objective or enhancement in play! 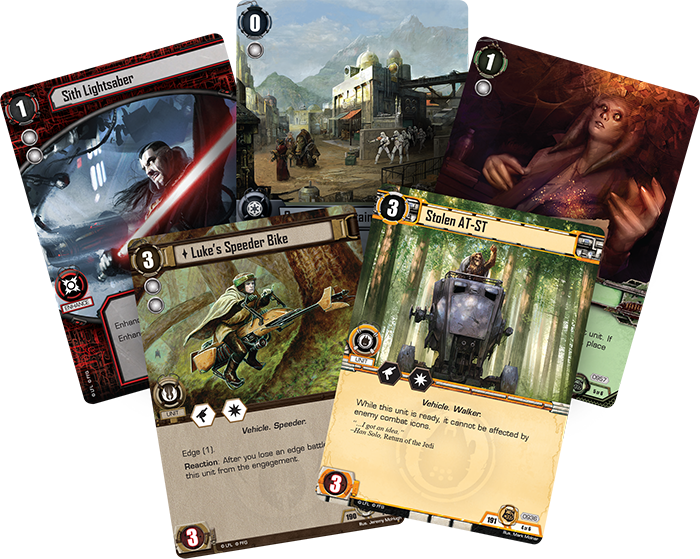 The amount of Force icons that Battle of Endor can gain is capped at three, but at that point, it boasts four Force icons – more than any other fate card in the game. 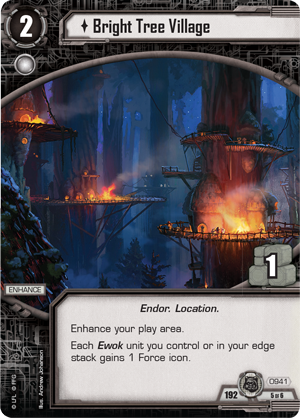 In many cases, a fully boosted Battle of Endor can win an edge battle singlehandedly, and since both players’ Endor objectives and enhancements add Force icons to the card, you may gain the full bonus of Battle of Endor more often than not. Whether you ally yourself with the Ewoks of Endor or crush them beneath the heel of the Galactic Empire, you can experience the thrills of Return of the Jedi again in New Alliances and the other Force Packs of the Endor cycle! Look for New Alliances at your local retailer in the fourth quarter of 2015.